For the power consumption, I used FurMark 1.8.2 and did a quick test with the upcoming FurMark 1.9.0. The graphics workload in the new FurMark 1.9.0 has been slightly increased, leading to more power consumption (few watts in more). The total power consumption of my testbed in idle is 117W. The GTX 580 comes with a power draw limiter (see here: GeForce GTX 580 Power Monitoring Details). To bypass the GTX 580 power draw limiter, I used a special version of GPU-Z (see here: GeForce GTX 580 Unlocked: 350W Under FurMark Thanks To GPU-Z). When the power draw limiter is enabled, the total power consumption of the system is 304W (FurMark settings: 1920×1080, fullscreen, Xtreme burn-in, no AA, no postfx). 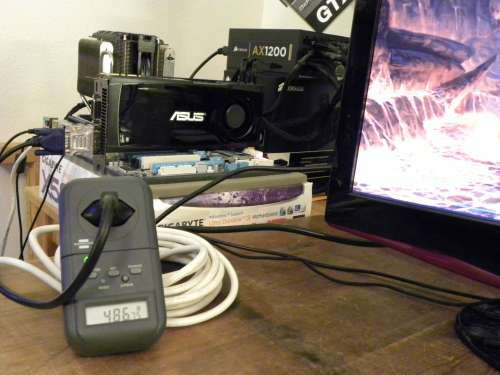 When the power draw limiter is disabled, the total power consumption reaches 439W for a max GPU temperature of 90°C (the ENGTX580 is used with its default clocks). 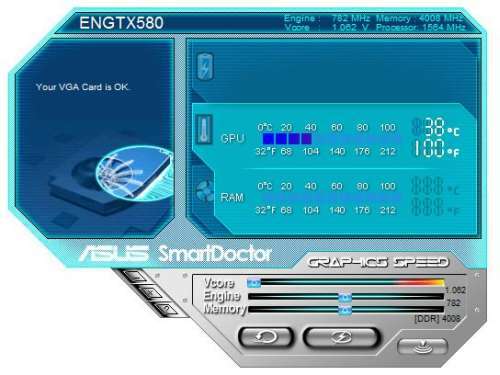 We can the calculate the power consumption of the ASUS ENGTX580. The Corsair AX1200 PSU has an efficiency factor of around 0.9 (see this article, there is a graph of the AX1200 efficiency). To reproduce such overclocking test, I recommend you to have some quality hardware, because we exceed the electric specifications of the system. In my case, a GIGABYTE A-UD5 motherboard and a high-end PSU: Corsair’s AX1200! 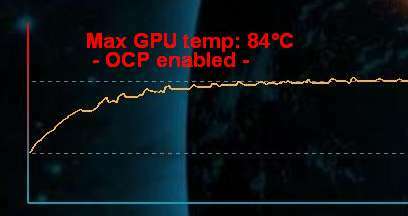 As you can see, with high quqlity products, stressing an overclocked GTX 580 with FurMark is not a problem. The max total power consumption of the ENGTX580 is 330W while the GPU one is 106W. The difference, 330-106 = 224W, is the power consumption of the rest of the board (especially the VRM). We clearly see the GPU throttling in action in the first picture while the second picture shows a more conventional temperature curve. 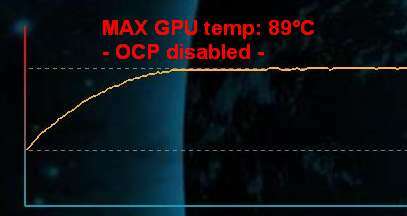 In Xtreme mode, when OCP is enabled, the GPU is permanently throttled back while this not the case when Xtreme mode is not used.